Have something random you want me to see? Object Rotterdam in HAKA gebouw. People who know me well enough are aware of the fact that I adore flamingoes. Not in the way that I have random items with flamingoes, but simply the animal itself. Their bright colors, the way they are always in a group yet have their independent attitude being so clear when observing them. Also, have you seen them defend the group or their offspring? Adorable. 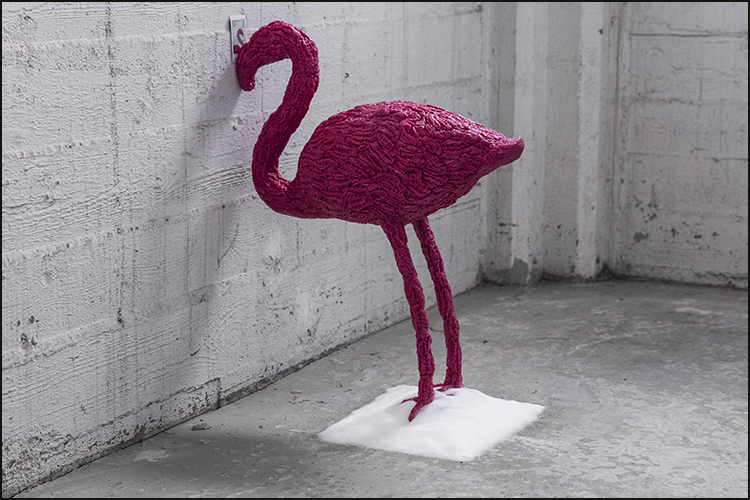 For Yasmina the flamingo was a bit more than just that pink cute animal. As you see this one in the image, it was originally part of more. It is asking attention for mass tourism and how we live nowadays. This theme is quite actual at this moment, humans being more aware of the climate and what we do to it. However, many of them are not doing too much about it. Yes, we protest and while it would make so much more sense to change habits it is not that simple. Personally, the first thing that came to mind when seeing it was something I read about some ancient punishment for childeren who wouldn’t listen. They have to keep a piece of paper or a coin to the wall with their nose and are not to drop it or they would have some serious punishment waiting for them. Whatever the poor animal has done, I would not know, but of course a flamingo is a bit pigheaded by nature so it would make sense in some way. Some more art of the artist was to be seen in the small exhibition at Art Rotterdam. However, this colourful little thing was the attentionseeker of the day. An old piece reviving here, recycling is key after all. For more Random Things I saw in pink click here.